It was two weeks ago, when we saw one Excavator from 2LegoOrNot2Lego (Ingmar Spijkhoven). Today I wanted to show here another model from him - An American Truck with Trailer. It is the second one made by Ingmar and it presents several points of interest. Despite several PF motorizations, it keeps almost the original Model Team inspiration and somehow makes me to remember the mythic Black Cat (5571, Giant Truck). It features a self connecting fifth wheel on the truck, plus functioning outriggers and parking brake, on the trailer. Additionally, the truck also features independent suspension on both rear axles (spring leaf) and steering function made with the old Flex Cable system parts. You may see also another video with the details about the fifth wheel working principles, together with other trailer functions (outriggers and brakes). For a more complete description about this model, take a look at Ingmar MOCpages, or this BrickShelf folder for more detailed images. Very VERY nice! The look of the model is great and all the chrome pieces really makes it "pop". And I always love to see suspention on trucks like this, take note TLG haha! The finish of the design is very neat and all the mechanisms, besides from some gears being allowed to slip in the video, are tightly packed and quite well realised, the steering motor in the front with it's belts would pass as an engine at first glance, whist also preventing gear slippage. This model with it's trailer and excellent working 5th-wheel and brakes arangement is also a good case for being fully remote controlled which is very well done here. Color schema is also very attractive! 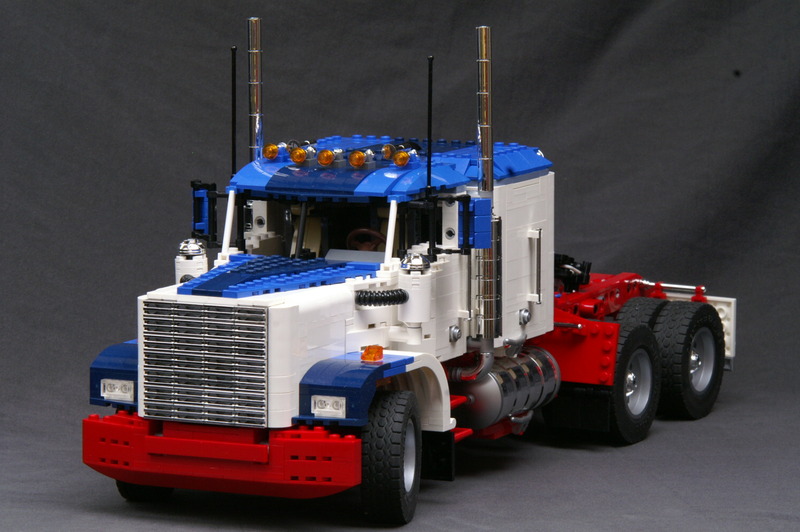 Its one of the best Trucks I've seen I love this model and if Lego are Paying attention I would buy it! I'd much rather have this than a Taj Mahal or Eiffel Tower! Nice to see more integration between technic and traditional system bricks. The plates in recent years helps finish the framework of most models but, I still prefer this look. It's a really talented builder who can combine the mechanical and sculptural skills together like this. To me, this is the ideal LEGO model. A complete blend of Technic function with Model Team looks. If TLG were ever to produce such a model, I'd gladly pay several hundred dollars for it. In fact, I'd gladly pay Ingmar to tell me how to make one right now!! Great work on this model. It is truly beautiful.